In this day and age, having proper home insulation is a necessity. If your home isn’t correctly insulated, you could be squandering untold sums of money on your heating and cooling bills. So, instead of sending all that money to the utility company, why not invest it in new home insulation? New insulation will (1) make it dramatically easier for you to heat and cool your home (2) cut down on the size of your home’s “carbon footprint,” and (3) make your home more attractive to prospective buyers. Fortunately, thanks to a local home improvement company like The Board Store Home Improvements, buying new insulation for your home is a remarkably easy process. 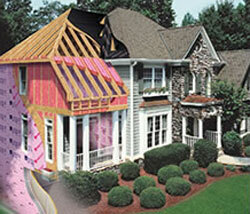 In fact, we are an Owens Corning Preferred Contractor, which means that we have the skill, experience, and customer service acumen to properly handle all of your residential insulation needs. Plus, at The Board Store Home Improvements, we continually strive to give homeowners the best possible value for their money. We offer no-pressure consultations plus highly generous warranties on all of our products and services. Contact us today to request a quote. Based in La Crosse, we proudly serve homeowners in Winona, Holmen, Sparta, Caledonia, and beyond.